This landmark volume in the Teachings of the Buddha series translates the Suttanipata, a text that matches the Dhammapada in its concise power and its centrality to the Buddhist tradition. Celebrated translator Bhikkhu Bodhi illuminates this text and its classical commentaries with elegant renderings and authoritative annotations. 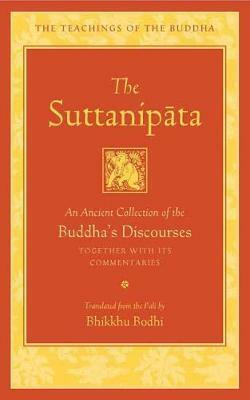 The Suttanipata, or "Group of Discourses" is a collection of discourses ascribed to the Buddha that includes some of the most popular suttas of the Pali Canon, among them the Discourse on Loving-Kindness Sutta. The suttas are primarily in verse, though several are in mixed prose and verse. The Suttanipata contains discourses that extol the figure of the muni, the illumined sage, who wanders homeless completely detached from the world. Other suttas, such as the Discourse on Downfall and the Discourse on Blessings, establish the foundations of Buddhist lay ethics. The last two chapters--the Atthakavagga (Chapter of Octads) and the Parayanavagga (The Way to the Beyond)--are considered to be among the most ancient parts of the Pali Canon. The Atthakavagga advocates a critical attitude toward views and doctrines. The Parayanavagga is a beautiful poem in which sixteen spiritual seekers travel across India to meet the Buddha and ask him profound questions pertaining to the highest goal. The commentary, the Paramatthajotika, relates the background story to each sutta and explains each verse in detail. The volume includes numerous excerpts from the Niddesa, an ancient commentary already included in the Pali Canon, which offers detailed expositions of each verse in the Atthakavagga, the Parayanavagga, and the Rhinoceros Horn Sutta. Translator Bhikkhu Bodhi provides an insightful, in-depth introduction, a guide to the individual suttas, extensive notes, a list of parallels to the discourses of the Suttanipata, and a list of the numerical sets mentioned in the commentaries.